Arthroscopy is a way to find problems and do surgery inside a joint without making a large cut (incision). Your doctor put a lighted tube with a tiny camera—called an arthroscope, or scope—and surgical tools through small incisions in your knee. You will feel tired for several days. 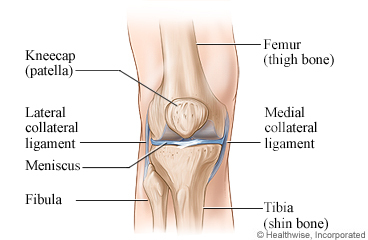 Your knee will be swollen, and you may notice that your skin is a different colour near the cuts (incisions). The swelling is normal and will start to go away in a few days. Keeping your leg higher than your heart will help with swelling and pain. You will probably need about 6 weeks to recover. If your doctor repaired damaged tissue, recovery will take longer. You may have to limit your activity until your knee strength and movement return to normal. You may also be in a physical rehabilitation (rehab) program. You may be able to return to a desk job or your normal routine in a few days. But if you do physical labour, it may be as long as 2 months before you can return to work. Rest when you feel tired. Getting enough sleep will help you recover. Use pillows to raise your ankle and leg above the level of your heart. Try to walk each day, after your doctor has said you can. Start by walking a little more than you did the day before. Bit by bit, increase the amount you walk. Walking boosts blood flow and helps prevent pneumonia and constipation. You may have a brace or crutches or both. Your doctor will tell you how often and how much you can move your leg and knee. If you have a desk job, you may be able to return to work a few days after the surgery. If you lift things or stand or walk a lot at work, it may be as long as 2 months before you can return. You can take a shower 48 to 72 hours after surgery and clean the incisions with regular soap and water. Do not take a bath or soak your knee until your doctor says it is okay. If you had a repair of torn tissue, follow your doctor's instructions for lifting things or moving your knee. If you have a dressing over your cuts (incisions), keep it clean and dry. You may remove it 48 to 72 hours after the surgery. Move your toes and ankle as much as your bandages will allow. Bend and straighten your knee slowly several times during the day. Depending on why you had the surgery, you may have to do ankle and leg exercises. Your doctor or physiotherapist will give you exercises as part of a rehabilitation program. To reduce swelling and pain, put ice or a cold pack on your knee for 10 to 20 minutes at a time. Do this every 1 to 2 hours. Put a thin cloth between the ice and your skin. Your foot or toes are numb or tingling. Your foot is cool or pale, or it changes colour. Red streaks leading from the incisions. Pus draining from the incisions. Enter I338 in the search box to learn more about "Knee Arthroscopy: What to Expect at Home".